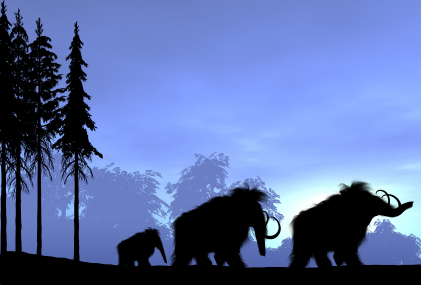 During the Pleistocene (approximately 1.5 million years ago), the tundra covered all central Europe and was inhabited by spectacular animals, for instance mammoths and woolly rhinoceroses. In 1999, the Siberian permafrost gave back a huge specimen of a mammoth, which had been frosted for 23 thousand years. The huge mammal, a male of approximately 50 years, was found by chance because its long tusks stuck out of the ground. The animal was so well preserved as to allow scientists to analyse the contents of its stomach and try to understand what its diet must have been like.